Everything Must Change, is an amalgam of European electro-beats, West African polyrhythms, Arabic and Middle Eastern melodies and, all-stops-out rock. 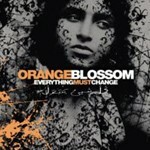 Orange Blossom create a new kind of music, music that references past and future, crosses cultural and linguistic borders. Music to dive in to, bliss out to, to make you giddy, laced with beautiful, sing-a-long Arabic lyrics, lifted by lush classical strings and tempered by dark, driving beats, Leftfield electro trance. Sweet-smelling, street-smart dance music. Or, if you like, an expression of hope and unity. Stránka vygenerována 22.4.2019 v 21:04:41 za 0.22 sekund.